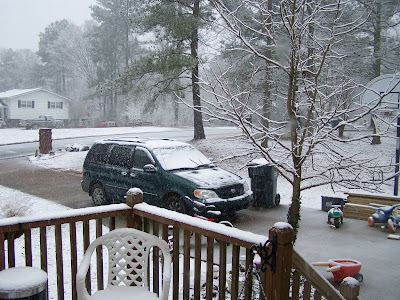 In The Lord's Path~: SNOW in the Southeast! This is why I don't have a normal Friday post for you all. We got hit with snow today, and while I am SOOOOOO excited about it, it meant that we had a very different day than what was planned. Because it is so warm here, this snow will be ice tonight and that means we can't leave the house tomorrow. So we had to get that bank deposits, gas and a few groceries today. We also have a friends birthday party to go to tonight. My husband is at Home Depot getting some lumber that he needs, before he can't get there at all! It is soooo beautiful though, and I'm so thankful that we got to have some descent snow this winter! I miss the feet of snow I'm used to having each winter, ever since I was a baby! I bet your children were excited! Have a great weekend! This does NOT look like Georgia! 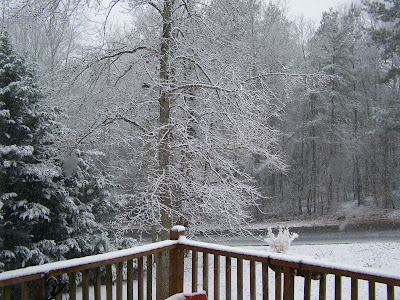 We have rain right now and it should get colder tomorrow, though not cold enough for snow. Hope the kids have fun playing in it! Snow can be fun... I always get excited when we get some, too! We don't get very much here, but this year has been an exception and our kids LOVE it! BTW - I was wondering if there was any chance you could repost your new chore system, or if you could email it to me. I'm wanting to revamp my system and yours looked great. Yes, ice is always another story! We have to go up two VERY steep hills to get out of our subdivision, and we almost didn't make it this morning! It took several attempts at the second one!